This entry was posted on September 8, 2015 by Jessica Anderson. The game below is for the 21+ crowd only. Play responsibly! Beer Pong is a favorite tailgating game at Husky Football. With college back in session and the football season gearing up, now's the time to get out your table and start practicing your throwing skills for BEER PONG! This fun drinking game requires a beer pong table, plastic keg cups, Ping-Pong balls, a healthy immune system and BEER! With 10 cups arranged in a triangle on each end of the table, the object of the game is to throw a ping pong ball into a plastic cup at the far end of the table. If you make the shot, the other team has to drink the beer in the cup. This game is great fun, especially at tailgates and other adult parties. We offer 4 styles of beer pong awards for your next event, whether it's at a tailgate, a house party, or a tournament for your fraternity or dorm. 1. Beer Pong Champion Trophy: This trophy has a beer pong insert in the middle of a wrapped silver ribbon. The bottom displays etched engraving for free! It was also a featured product on the Beer Pong All-Stars website, which features all things beer pong! 2. If you are looking for something to hang on the wall of your frat or dorm room, a Beer Pong Champion Plaque is an excellent choice. It's a black plaque with silver engraving with the same beer pong insert. A great way to show off a win! 3. 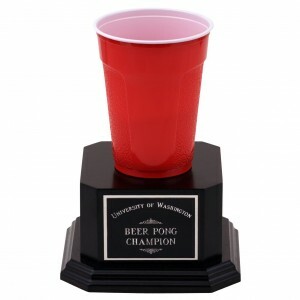 Beer Pong Tournament Award: A perpetual award, this popular larger trophy is impressive because the sides of the base can be engraved with different winner's names on it, so it can be passed around from person to person, year after year. With 3 side plates, it can hold up 12 winner's names, 4 on each side. Our Beer Pong Champion perpetual trophy. It's a customer favorite! 4. For a fun and inexpensive party favor or award, check out the Five Star Beer Pong Party Medallion. This includes a neck drape in your choice of color - match your favorite college team or Fraternity colors. At a starting price of only $7.20 each, they are an affordable award that your beer pong winners would be proud to wear! They even include engraving on the back of the medallion. All of our Beer Pong Trophies include customized engraving for FREE. At Trophies2Go, we don't count characters, and even logos are included in the price. The logo files that are compatible with our engraving machines are high quality, high resolution JPG files and EPS files. If you have questions about engraving for your beer pong trophies, just give us a call at 1-877-926-4700. 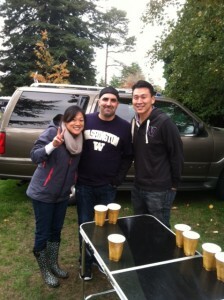 Remember to enjoy your beer pong responsibly and here's to a great fall season full of fun!